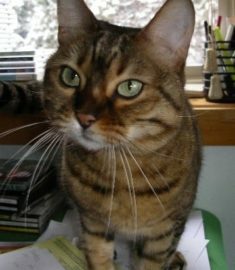 In the summer of 1998 a miracle occurred to me that would change my life forever when a litter of Bengal cats (Asian Leopard Cats) were born and a few weeks got the last kitten of that litter from the Sari the Bengal cat breeder. Sari brought that kitten to me and when I saw her I instantly knew that we were perfect for each other so I agreed to make her part of my family. I named her Sappho, after the famous Ancient Greek poet and playwright. The decision I made that day resulted in about 6,400 days (17.5 Years) of absolutely incredible experiences with a sentient, highly intelligent, amazingly beautiful Leopard Cat that far exceeded all my expectations. I grew up with cats and dogs and felt I knew them well – but Sappho was something much greater. The first sign that Sappho was something different occurred on day two, after bringing her into my home. While in my shower, she poked her head past the edge of the shower curtain and scanned the situation – AND THEN JUMPED INTO THE SHOWER WITH ME. She loved the water and showered with me at least once a week for her life. Her affectionate intimacy was unrivaled. She spent the first year of her life sleeping on my chest, her head to my chin. And for her entire life, she preferred to sleep on my chest, but she was very smart and learned to always watch me and wait till I settled into near sleep, crawling up on my chest when it appeared that I was done moving around. Sappho also spoke a language, making unique sounds for different situations. Many animals do this, of course: a certain bark means “take me out”, a certain meow means “I am in pain,” but Sappho spoke much more than that. She even named me! Every time I walked into a room with her or returned home she would make that unique sound. I always considered that sound to mean, “Hello Daddy.” Her style of communication was so deep that she saved the life of one of our other cats TWICE by simply tracking me down in the house, and speaking to me in sounds that, for her, must have meant “follow me” or “help is needed.” She used that particular word many times when she detected something amiss. And last, but not least, Sappho enjoyed being outside with me every chance she could. And within her first year she became adept at walking on a leash, following commands like a dog. The French have a term, Joie de vivre, and it means zest or passion for life. Sappho possessed the strongest Joie de vivre, I had ever experienced in ANY creature, including most humans. Up until just the few hours prior to her unexpected death from kidney failure, Sappho was fully engaged with life, acutely aware of everything around her, expressive and communicative. Her passing was devastating to me and my family who got to know her during her 17.5 years. And it is our hope that ViaGen Pets will be able to make a clone of her from the brain cells our vet collected.